I'm no David Copperfield, but I do believe in magic. To me, cosmetic products are the best magician's props. It conceals freckles and acnes, turns pale cheeks to cherry red, and dull eyes to seductive cat eyes. Okay, so everybody knows the greatness of cosmetics..but how much do you know about the germs that cosmetic products cause? The secrets to the best makeup is not about what expensive products you use, or how much product you use. It's all about HYGIENE of your magical props! 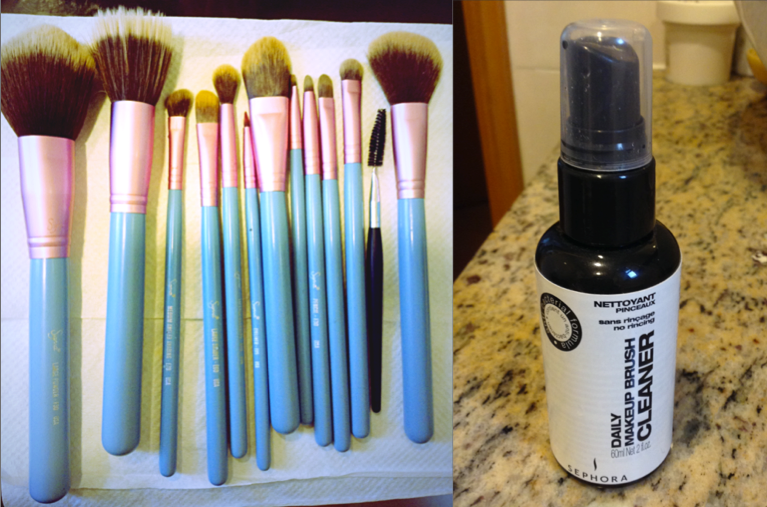 Today, I want to share with you my makeup brush cleaning routine. In order to maintain cleanliness of your brushes, you'll need a 'makeup brush cleaner'. I got mine at Saphora while I was travelling in Barcelona, I know there isn't any Saphora in HK..
but I guess any kind of makeup brush cleaner will do. After this procedure, your makeup brushes would be as good as new and this could prevent skin breakouts. CLICK the link for the brush set, however I have no idea why they've changed the colour of the brush collar for the 12 brushes complete kit to silver. The 7 brushes travel kit still has a pink collar FYI.